The photograph depicts the completion of the most recent construction at the I-4 and U.S. 17-92 interchange in December 2007. For the Florida Department of Transportation (FDOT), improving the interchange of Interstate 4 (I-4) and U.S. 17-92 in Seminole County is not a one-off project, but an ongoing commitment. Years ago, eastbound motorists headed to DeBary or Orange City had to exit I-4 onto Orange Boulevard, proceed through a three-way traffic signal at Lake Monroe Road and cross an active railroad track in order to reach U.S. 17-92. In 2007, FDOT streamlined the trip by adding a flyover ramp that today carries traffic directly from eastbound I-4 to U.S. 17-92. The $22.3 million project not only reduced delays during afternoon rush hour but also gave emergency responders a more direct route to nearby Central Florida Regional Hospital. Now more than 30,000 motorists use the interchange every day, and FDOT is designing additional improvements to the interchange as part of I-4 Beyond the Ultimate. The design team is looking to realign U.S. 17-92 to the south with a new bridge carrying the highway over I-4. Roundabouts are proposed to replace two existing traffic signals to improve traffic flow on the old 17-92, now known as Seminole Boulevard. The project will also widen the main I-4 bridges over Orange Boulevard and the SunRail line. The interchange project is still in design, but preparations are already underway. In fact, one small, recent change promises big benefits for local residents. In 2017, by mutual agreement, FDOT transferred a segment of old 17-92 to the City of Sanford. The 3-mile corridor, which hugs the south edge of Lake Monroe between State Road 46 and Monroe Road, will become part of the city’s expanded RiverWalk trail - making the upcoming interchange improvements a win-win for motorists, bicyclists, pedestrians, and anyone who just likes to unwind by the lake. RiverWalk-related work has already begun along West Seminole Boulevard. A section of the road was closed for construction on March 11, and closures will continue until approximately September 30. For more information about the RiverWalk Construction Project, visit www.sanfordfl.gov/home#News. Residents and motorists, who already are familiar with the I-4 Ultimate project, may soon begin to see and hear more about the I-4 Beyond the Ultimate project. At the same time, they may also hear that the Wekiva Parkway is linking to Interstate 4 (I-4) north of Lake Mary. So, it’s natural for motorists to wonder how these three important projects taking place on major highways in Central Florida will connect and relate to each other. 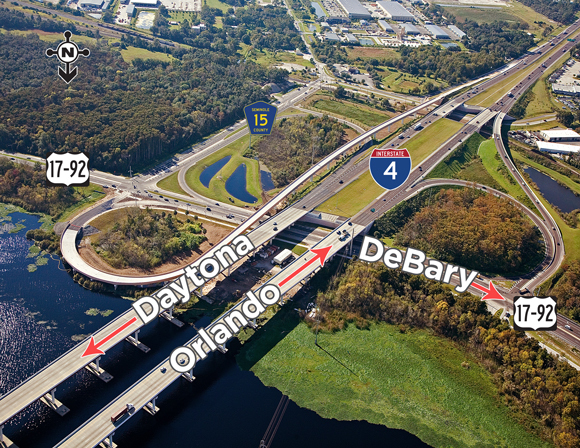 I-4 Ultimate is the current 21-mile reconstruction of I-4 that stretches from the interchange with Kirkman Road (S.R. 435) in Orange County through downtown Orlando to the interchange with State Road (S.R.) 434 in Seminole County. I-4 Beyond the Ultimate is a collection of design segments that will improve I-4 for another 20 miles on both ends of the I-4 Ultimate project. Two interim projects will start in 2019 in Seminole County to improve traffic flow on eastbound I-4 and extend the life of the I-4 travel lanes. 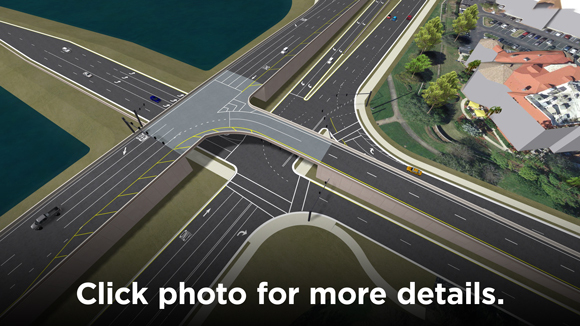 Another interim construction project is scheduled to begin in 2020 that will transform the Daryl Carter Parkway overpass into an interchange with eastbound I-4 exit and entrance ramps and a westbound I-4 exit ramp. 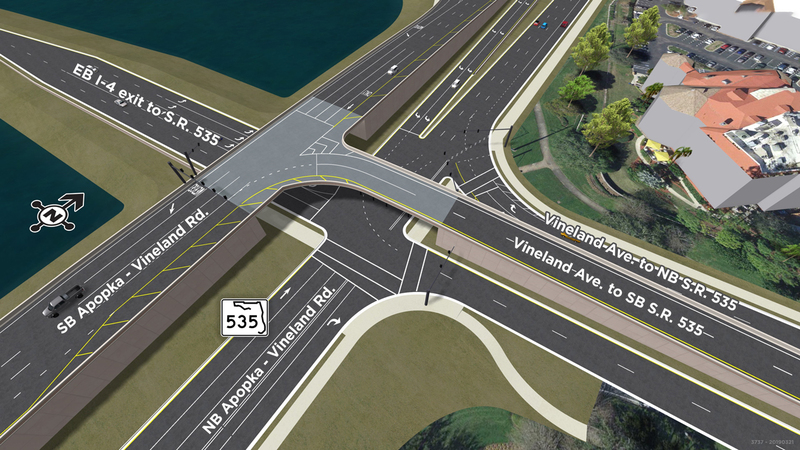 Also in 2020, the first complete reconstruction of an interchange for I-4 Beyond the Ultimate is expected to begin at Sand Lake Road (S.R. 482). I-4 Beyond the Ultimate construction projects will match the look of I-4 Ultimate and will appear nearly seamless to motorists. But the improvements will move forward in smaller increments. In other words, construction will focus on a few miles at a time, rather than 20 or more miles at once. Wekiva Parkway (Section 8) is the final part of the beltway system around Central Florida managed by FDOT and the Central Florida Expressway Authority. This section will connect to I-4 in Seminole County will complete the loop around Orlando and surrounding communities, improving safety, mobility and connectivity in the region. 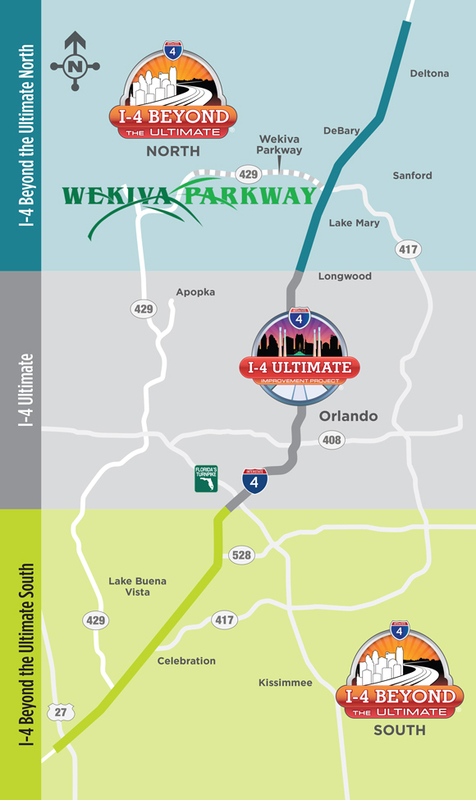 These projects can be viewed in detail by going to the corresponding websites for I-4 Ultimate, I-4 Beyond the Ultimate, and Wekiva Parkway. The websites feature maps, artist renderings and more about construction activities and schedules. I-4 Beyond the Ultimate may include construction of sound barriers to help reduce sound between the interstate and adjacent neighborhoods. Many factors determine sound barrier locations. The Florida Department of Transportation (FDOT) has conducted multiple noise studies for the 40 miles of design segments in I-4 Beyond the Ultimate. Based upon the completed noise studies, construction of sound barriers will be considered for residential communities and business districts adjacent to I-4. 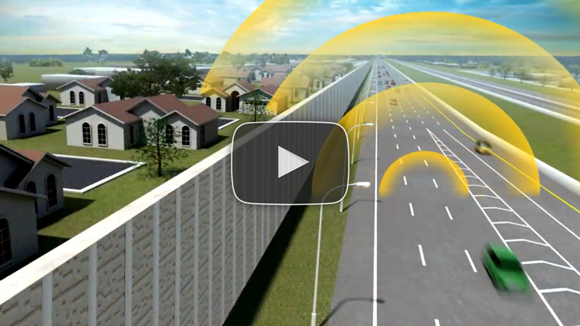 Watch the video to learn more about how FDOT studies noise from the interstate.